James Kahler listens to motions June 16 at the Osage County Courthouse. LYNDON—A man accused of killing his wife, two teenage daughters and his wife’s grandmother in Burlingame will still face the death penalty if he is convicted of the crimes, after a ruling by a district court judge last week. 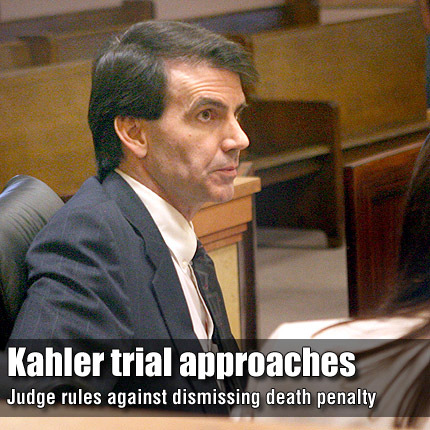 Attorneys for James Kraig Kahler filed a motion June 2 challenging the constitutionality of the Kansas death penalty, citing the punishment is applied unequally and discriminatory, the death penalty is cruel and unusual punishment, and the manner in which it is carried out is cruel and unusual. Kahler, 48, is charged with capital murder for the deaths of his wife, Karen, the couple’s teenage daughters, Emily and Lauren, and Karen’s grandmother, Dorothy Wight. All were shot in Wight’s Burlingame home Nov. 28, 2009.